What's a 40-Hour Work Week? The Clock staff works hard, like you. Theirs is a decades-old legacy of humor, loyalty, and a solid work ethic. Read their stories here. Then go in to swap stories with them over a lemonade and BBQ sandwich. 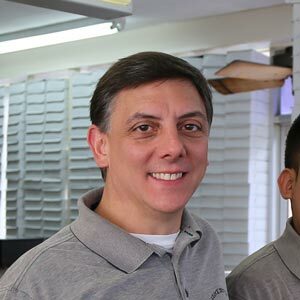 John Banias has owned and operated the Clock since 2001, but he’s been working there since he was three years old. Okay, since third grade. And he did take some time off to attend the College of Charleston and a seven-year stint with the State of SC. But seriously, John has been at the Clock forever. Because John’s father was both Clock operator and worked insanely hard, John spent nearly every afternoon after school in the restaurant, doing homework or trying to mingle with the high schoolers who made the Clock their “spot.” John remembers begging to work Friday nights–prime cool teenager time–and boycotting wearing the signature white paper hat while doing it. Some things just don’t change. John still won’t wear a white paper hat (not even for one picture! 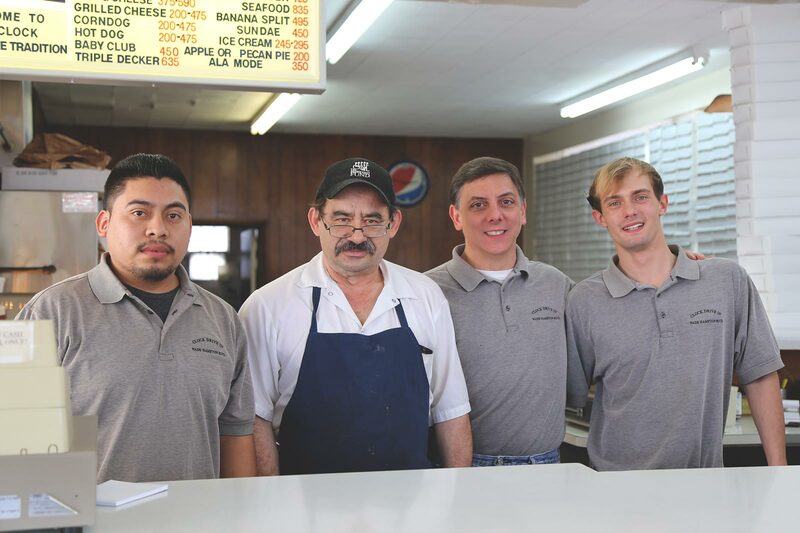 ), and is still working hard at the Clock Drive-in as owner, a role he took after his father’s retirement. When he is not at the Clock, John is spending time with family, working out at the gym, or volunteering with AHEPA at the Greek Festival. Gus is like family to John and Clock customers alike. 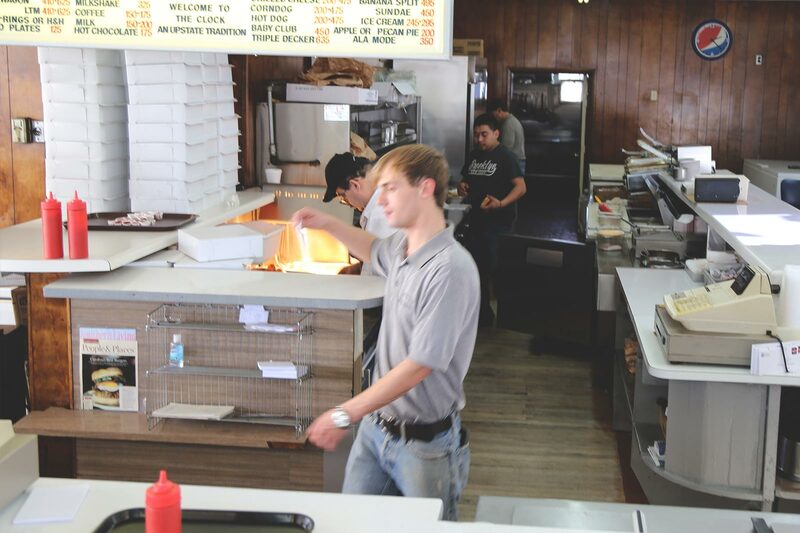 If you drop in for lunch, chances are good you’ll see Gus behind the register or bustling around the kitchen. Gus was born in Greece. His father moved to the United States in 1968, followed by Gus a few years later at age 16. He was grateful to live and work around other Greeks who, like him, had moved to the states in search of opportunities to work and thrive. Gus’s father and uncle owned and ran a Boston Lunch downtown until the mid-90’s. 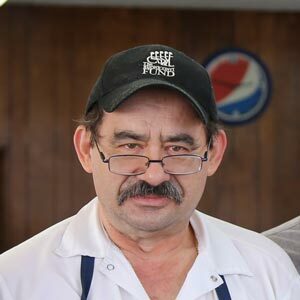 Gus worked at the Boston Lunch and later at Pete’s on Stone Avenue until the late 90’s, when he finally joined the Clock family. Though Gus is a keystone of the inner workings of the Clock, but a man can’t work forever. Drop in and get to know Gus before he retires!